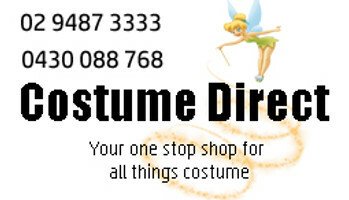 Buy cheap costumes at Costume Direct, with delivery to Sydney, Melbourne, Adelaide, Perth, Brisbane and Australia wide. Our online costume shop has a wide range of costumes suitable for book week, Halloween, costume parties and dress up. These include era costumes like 1920's costumes, 1950's costumes, 1960's costumes, 1970's costumes, 1980's costumes, 1990's costumes, Great Gatsby costumes, Abba costumes and Grease costumes. The kids will love our wide selection of costume themes including Disney costumes, Superhero costumes, Alice in Wonderland costumes, Batman costumes, Wheres Wally costumes, Disney princess costumes and many many more! Dress for the holidays with our wide range of international costumes and holiday costumes, including Christmas costumes, Halloween costumes, Easter costumes, St Patricks Day costumes, Day of the Dead costumes and many more. If you need to buy or rent a costume, think no further than Costume Direct. For all enquiries and queries, please contact one of our specialised staff by phone or email.